Graham County is rich in history and if you are a history buff, you should consider exploring some of the historical sites of the area while you are here. One of the easiest sites to visit is the “Bas Shaw” Gravestone off 129 (The Dragon). 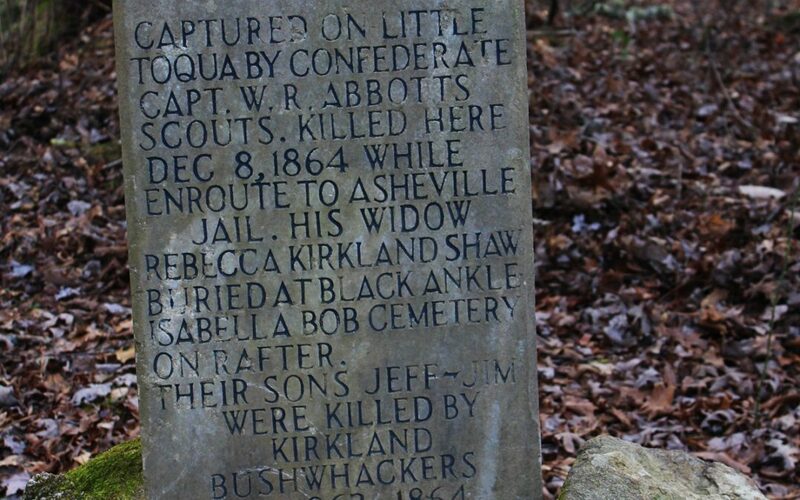 The story of the man buried there goes back to the notorious Kirkland Raiders during the Civil War.During the Civil War, Graham County (then part of Cherokee County) offered scant support to the confederate cause, allegedly because the region was not financially dependent on slavery. However, there were passionate Confederates and Unionists who lived here. History indicates that most families wished to remain neutral but were pressured into choosing sides. It was a terrible time. Families were split,and churches divided when choices were made. The people in this region suffered from both Union and Confederate raiders. Renegades or “bushwhackers”were a huge problem because of the rugged terrain that offered convenient hiding places. John Jackson “Bushwhacking” Kirkland mounted a reign of terror in these mountains. He started out as a second lieutenant in the Third Tennessee as a confederate. Apparently, he deserted early on. The Union Army burned his family grist mill on Turkey Creek near Tellico Plains. At that point, Kirkland swore revenge and everyone in the area became his prey. Bas Shaw was John Jackson Kirkland’s uncle by marriage. Shaw’s wife and Kirkland’s mother were sisters. Not that it seemed to matter. Around 1863 or 1864, John Kirkland ambushed a Union Army Unit on the Little Tennessee River. During the ambush, two of Bas Shaw’s sons were killed. On December 7, 1864, the Raiders, on their way to rob a grist mill and general store, met up with a Union outfit. Bas Shaw was taken prisoner along with his 17-year-old son Joe Berry Shaw. Joe was only 17 and was released because of his age. The Confederate soldiers took Bas Shaw, telling him they were taking him to Asheville. He never made it. 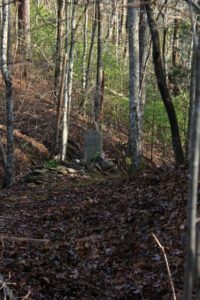 The captors may have just decided to kill him, or he could have attempted escape, but his grave site is now known as Shaw Grave Gap at the Big Poplar Turn above U.S. Highway 129. The location of Big Poplar Turn is 6.5 miles past the Tennessee/North Carolina Line close to Deal’s Gap. There is a pull off on 129 where you can park. The grave is located on the right-hand-side, at the end of a very short trail up the hill. A visit to this grave site gives you a chance to appreciate the remoteness of the area and the daily danger and violence that residents lived with at that time. Surrounded by huge trees, it can feel like you have stepped back in time. 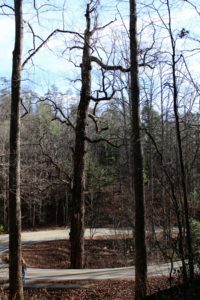 The ancient poplar tree that marks Big Poplar Turn may very well have witnessed the truth of what happened to Bas Shaw. Please be very careful parking and turning around on the “Dragon”. The traffic on the road can be heavy at times, and the tight curves make it difficult to see oncoming cars and motorcycles.